Blue 5 is a casually elegant restaurant where you will enjoy a meal suitable to your taste at a reasonable price. Renowned chef Richard Henri Todeschini creates selections for every taste - from our distinct barbeque "twin biscuits" and signature Blue 5 Burger to bacon wrapped monkfish, steak au poivre and ginger sesame tuna. Our lunch and dinner menus are now online. 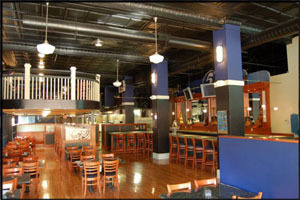 Blue 5 also offers various blues and jazz performances for a complete evening experience. Owner / General Manager Kerry Hurley brings his entertainment influence to Roanoke with the goal of making Blue 5 your entertainment destination. Review: Cool bar, but something changed, was it the menu being abbreviated? or was it the promise of two sides, and the delivery of one with the eleven dollar hamburger? I suppose it was the cold mac n swiss pie that put the frigid spin on what should have been good evening. Review: Went to Blue 5 recently to a jazz band, Lenny Marcus - great show! The atmosphere is unique for typically conservative Roanoke.. 16 microbrews on tap, including one of my favorites, Red Seal. I had the NY strip - healthy portion for the price. Definately returning soon. Rebecca and I decided to have a date night this past Friday. Date nights are fun because we usually like to try something new that this wonderful city has to offer, especially something in the downtown area. This date night we decided on Blue 5. Upon first entering the restaurant, the ambiance is outstanding. We were seated at a booth in the back of the restaurant which provided for quite a bit of privacy, which we both enjoyed. We started the evening with drinks, and a couple of appetizers. The first appetizer really wasn’t designed to be, but our wonderful waitress accommodated our request to split the fairly large portioned Caesar salad. Next up we had the Beef Skewers, which were just out of this world. Very tender, just enough spice with a little kick, but not hot enough that you are reaching for your glass. Rebecca described them simply as “Oh my god” and I would have to agree. However, the main courses were somewhat of a disappointment. I had ordered the Ella Burger, which had piqued my interest due to it’s combination of mushroom and Gouda. I had ordered the burger done medium, and it came out pretty much well done. Strike One. Along with the burger I had ordered their sweet potato fries. While they were cut like fries, they were far from fries in the classic sense. A pile of mushy strings would be the best way to describe them. Srike Two. Rebecca ordered the Penne Cuervo, which is described as lime chicken with a combination of peppers and cream over penne pasta. It was truly a bland and boring dish, reminiscent more of something you’d order at a large chain like TGI Fridays, only at twice the cost. Strike Three. We had originally intended to stay for the entertainment that was performing that night, but after experiencing some truly lousy main courses at such high prices, we had enough of Blue 5 and continued date night elsewhere. It would take something fairly special I think for me to give them a second chance at this point, because as most folks know, first impressions are everything. In our case, Blue 5 left us shaking our heads wondering what all the excitement is about. Review: Love Blue 5! Moved back to Roanoke last year and was surprised to see the Downtown scene under revitalization. I am so glad its non-smoking. It reminds me of something that would be in New Orleans .